For its efforts to foster a better-educated and informed society, Institute of Food Technologists (IFT) has earned 2018 ASAE Power of A Summit Award for its documentary, Food Evolution. The film explores food-related challenges we face globally, the critical role that science will play in addressing them, and the public perceptions and misperceptions involving the science of food. ASAE honored the documentary film which was commissioned to inspire discussion and show the critical role science and innovation play in building a safe, nutritious, and sustainable food supply for everyone. Amid a brutally polarized debate marked by passion, suspicion, and confusion, Food Evolution looks at one of the most critical questions facing the world today—that of food security—and demonstrates the desperate need for common sense, solid information, and calm logical deliberation. Using the often angry and emotional controversy over genetically-modified foods as its entry point, Food Evolution shows how easily fear and misinformation can overwhelm objective, evidence-based analysis. Food Evolution takes the position that science, scientists, and a well-informed public hold the key to solving the world’s food crisis. IFT worked together with Black Valley Film’s Scott Hamilton Kennedy, an Academy-Award nominated director, documentarian, and story teller, and entrusted him with the task of telling a provocative story about the science and the scientists that are essential to a global food system that feeds a global population. Kennedy embarked on this challenge and over three years of investigation and unpacking the central themes around distrust, information, science and myth, found at the center of this story, a highly-charged debate that was emblematic of the larger theme. 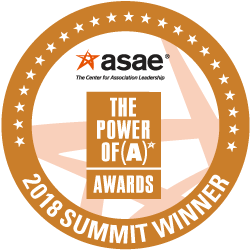 ASAE’s Power of A (association) Awards, the industry’s highest honor, recognize the association community’s valuable contributions on the local, national, and global levels. The Power of A Awards reward the outstanding accomplishments of associations and industry professionals who work tirelessly to strengthen lives, the workforce, our systems and structures, the economy, and the world. Congratulations and thank you to IFT for exemplifying how associations strengthen the world.